Stan and Ollie is a bittersweet look at the legendary comedians last performances. It is a tale of friendship and fading glory. Told with a sprinkle of melancholy to accompany the brilliant humor. Stan Laurel and Oliver Hardy made over a hundred films together. Their slapstick routines vaulted them to megastar status for decades in early Hollywood, but the limelight did fade on their significant talents. Steve Coogan and John C. Reilly nail the exasperation and tremendous love the men had for each other. Both men knew their fame was a shared success. You couldn’t have one without the other, and in their final moments together; they wouldn’t have it any other way. Stan & Ollie opens up in 1953 with the duo embarking on a concert tour of Great Britain. Stan Laurel (Steve Coogan) had convinced his dangerously overweight and chronically ill partner, Oliver Hardy (John C. Reilly), to come out of retirement for another shot at movie stardom. Stan had a shaky deal to have them film a comedic version of Robin Hood. The plan was to have the film’s producer see them on stage in London at the end of the tour. By then they should have drummed up enough publicity to secure funding for the film. The tour does not start as expected. Stan & Ollie are playing second rate theaters to half empty audiences. They’re staying in cheap hotels, lugging their suitcases and props around. The physical stress affects Ollie, but he soldiers on. The men gave their best efforts, delighting the trickle of fans who came to see them. Their manager, Bernard Delfont (Rufus Jones), asks them to do local publicity stunts. Stan & Ollie soon find themselves at store openings and judging beauty pageants. Their wives (Shirley Henderson, Nina Arianda) decide to join them on the tour. Their presence trudges up old feelings of bitterness and resentment. Sixteen years previously, Stan refused to continue working with Hal Roach (Danny Huston), the studio chief that paired them initially. Still under contract, Ollie made a movie without him. It was a mistake that the near inseparable team never got over. The first thing that struck me about Stan & Ollie was the perfect runtime. The film clocks in at a lean ninety-seven minutes, every second of which is absolutely engrossing. There’s never a lull in the action. We see Stan & Ollie come to terms with each other at the final gasp of their long careers. Scottish director Jon S. Baird (Filth) imbues the film with humility and warmth. He recreates their famous skits with the grinding tour as the everpresent backdrop. You laugh as they bumble around on stage, but feel their disappointment at playing subpar venues. The third act of Stan & Ollie is sublimely done. It’s a fitting bookend to two men who were true partners. Steve Coogan and John C. Reilly give life to stars that passed away more than fifty years ago. They have excellent screen chemistry. Flawlessly pulling off the sharp comedic timing and dramatic behind the curtains events. Stan & Ollie were vaudeville comedians. They could sing, dance, and improvise to perfection. The most entertaining parts of the film is watching how the pair worked together. Stan Laurel was obsessed with writing and refining material. He and Oliver Hardy were constantly bouncing ideas off each other. Diligence in preparation was a huge factor in their friendship. They enjoyed each other’s company. The film’s dramatic scenes largely concern Ollie’s failing health. He was near the end of his life. Steve Coogan, who is damn good in every role, gives Stan Laurel an earnestness that captivates. The always likeable John C. Reilly plays Oliver Hardy with a kind personality and understanding demeanor. He’s a stunning doppelganger with the make-up and fat suit. Hardy struggled mightily to complete the tour, but could never let Stan down. 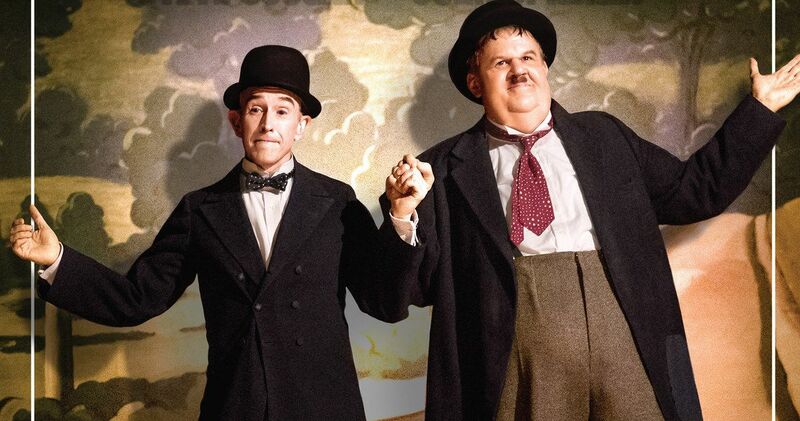 Stan & Ollie is a fitting tribute to Laurel & Hardy. It is a wonderful small film about bygone greats. Their style of comedy required real talent. Hollywood was built on the physical performances of the vaudeville greats. We will never forget Laurel & Hardy, Charlie Chaplin, and Buster Keaton to name a few. Stan & Ollie is distributed by Sony Picture Classics and in theaters now.